The team of researchers is being led by Konrad Hungerbühler, a professor of safety and environmental protection technology in chemistry at ETH Zurich. They have identified wood or cellulose waste from the forestry and paper industries as the best source material. The team also included scientists from Switzerland’s EPFL and Sweden’s Chalmers University of Technology. Hungerbühler’s group member and lead author of the study Merten Morales said: "Cellulose, found in wood, can be converted to glucose by adding acid. "If it is possible to use wood waste, in other words: waste from the forestry industry, that is what we should do. "Then there is no competition with the food supply chain." The team said that today’s chemical industry is based on oil and used for many products, from plastics to detergents and solvents to medication and crop protection products are being produced from oil and its constituents. Since oil reserves are limited, scientists have been exploring alternate ways to manufacture these products from sustainable materials. While developing the new process, scientists used simulation procedures to compare different manufacturing methods and bacteria, which were optimised in the laboratories at EPFL for manufacture of succinic acid by biotechnological means. The findings demonstrated that biotechnological manufacture using wood waste is either cheaper or more eco-friendly than traditional methods based on oil, depending on the bacteria and processes used. Scientists measured that for a specific biotechnological manufacturing process, succinic acid can be produced 20% cheaper than conventional methods. "The environmental impact can be reduced by 28%." Furthermore, using a second method with different bacteria, the environmental impact can be reduced by 28% with comparable costs to conventional oil-based means. While making succinic acid using bacteria, glucose is required as the raw material that can be extracted from sugar beet or sugar cane, and also from wood. Researchers compared the succinic acid manufacturing process that includes sugar beet with the process from wood waste and found that the differences between the processes are negligible in terms of cost-effectiveness, environmental impact and safety. This new process will also support the paper industry. The research team said that construction of a biotechnological production plant that makes succinic acid from wood would require a long-term investment and be matter of consideration for chemical engineers. 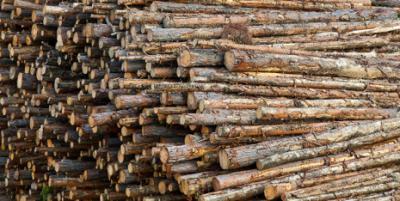 Image: The timber industry generates waste, which can be used for other materials and components. Photo: courtesy of Colourbox.